(Reuters) - Broadcom Inc announced a $18.9 billion deal to buy U.S. business software company CA Inc on Wednesday, venturing far beyond its realm of semiconductors and testing investors' confidence in its Chief Executive Hock Tan's dealmaking credentials. The CA deal, outlined in a joint statement from the companies, comes just four months after U.S. President Donald Trump blocked Broadcom's $117 billion hostile bid for semiconductor peer Qualcomm Inc, arguing it posed a threat to U.S. national security and gave an edge to Chinese companies looking to build next-generation wireless networks. Dealmaking has been key to Broadcom's expansion, as it grew from a 4 percent share of the chip market in 2013 to a 30 percent share this year, thanks to acquisitions spearheaded by Tan with backing from private equity firm Silver Lake. Tan's selection of CA as Broadcom's next acquisition target, however, took Wall Street by surprise, and drove Broadcom shares down 7 percent in after-hours trading. Investors and analysts scrambled to identify potential synergies, as the deal looked more like a financial investment rather than a combination of complementary businesses. Broadcom's chips power smartphones, computers and networking equipment. CA, on the other hand, specializes in software for so-called mainframes, big servers that companies are gradually replacing with cloud computing, and has been seeking to expand in business software. 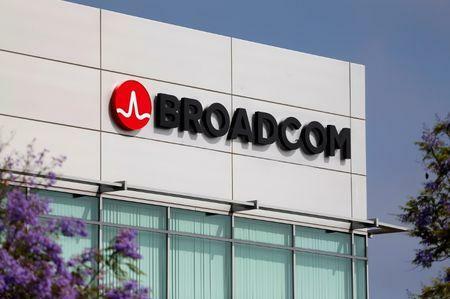 Broadcom will pay $44.50 per share in cash for CA, a 20 percent premium to Wednesday's closing price. It will finance the deal with cash on hand and $18 billion in new debt financing. Previously, as of May 6, Broadcom's debt stood at $17.5 billion. CA's largest shareholders, Careal Property Group AG and affiliates, which own 25 percent of the outstanding shares of CA, have agreed to vote for the deal, according to the announcement.